Independent villa, outdoor swimming pool, heating, air-conditioning, Wi-Fi, satellite TV, pets welcome (a charge is applicable), cleaner available by request, cook available by request. 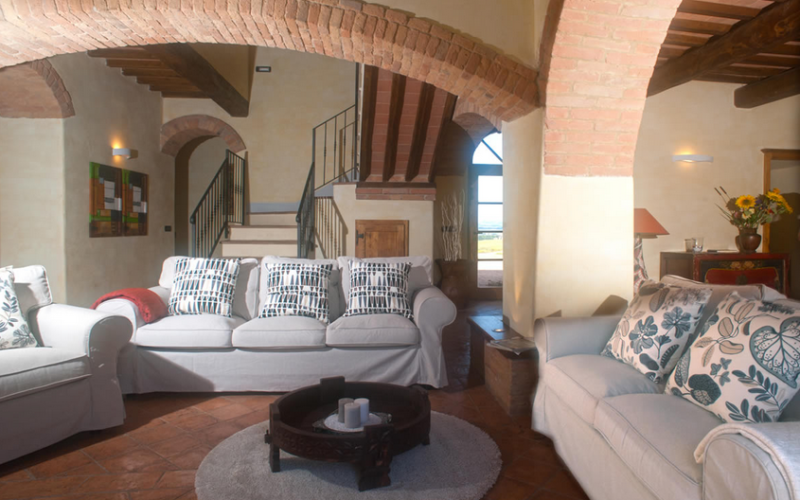 The villa has five independent entrances, four of which on the ground floor with the fifth on the first floor, reached via an outdoor staircase with 19 steps which opens onto a corridor that connects the rooms on the first floor. On the ground floor, the main entrance opens onto the living room and a glass door on the far side leads to the garden. A door from the spacious kitchen opens out onto the porch outside. A door outside leads to a service room which takes you into the living room. 1 service room with bunk beds + en-suite with shower and bidet. 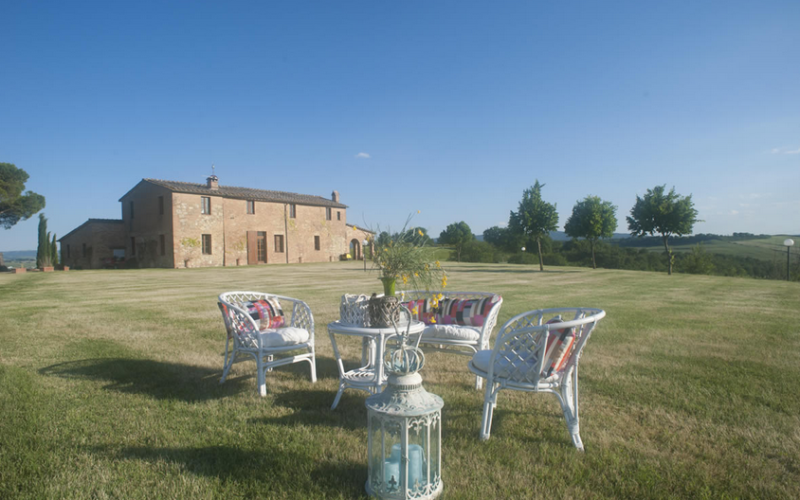 Beautiful villa in a fully renovated typical Sienese farmhouse. The renovation was completed in 2007. 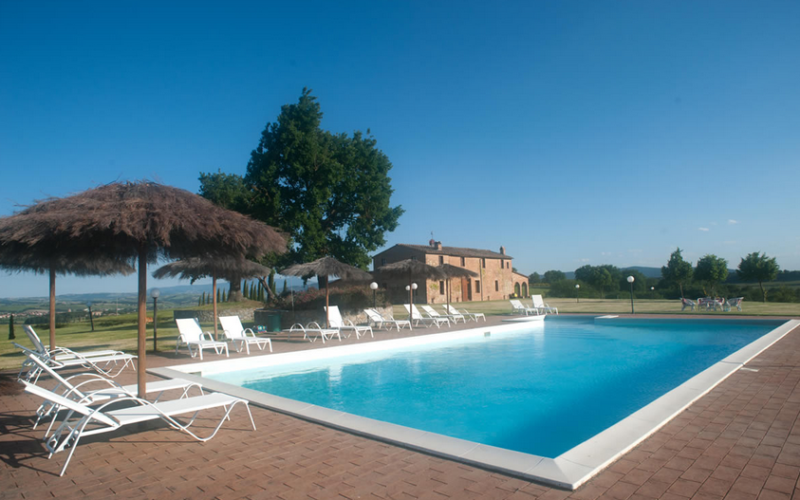 The villa is 1.5 km from Ponte d’Arbia, a little village with a bar, restaurant, grocery shop and butcher. Buonconvento is 6 km away and offers a broader selection of shops, a supermarket, restaurants, railway and bus stations. 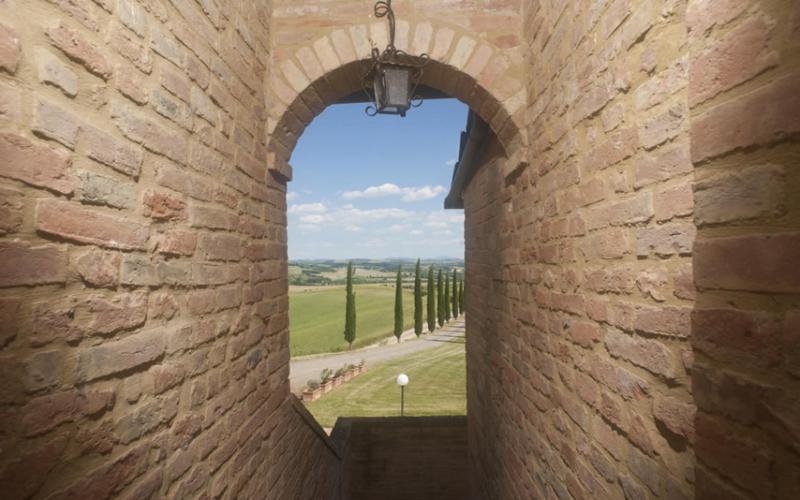 Montalcino is just 15 km away, with Siena at a distance of 23 km and Florence 80 km. 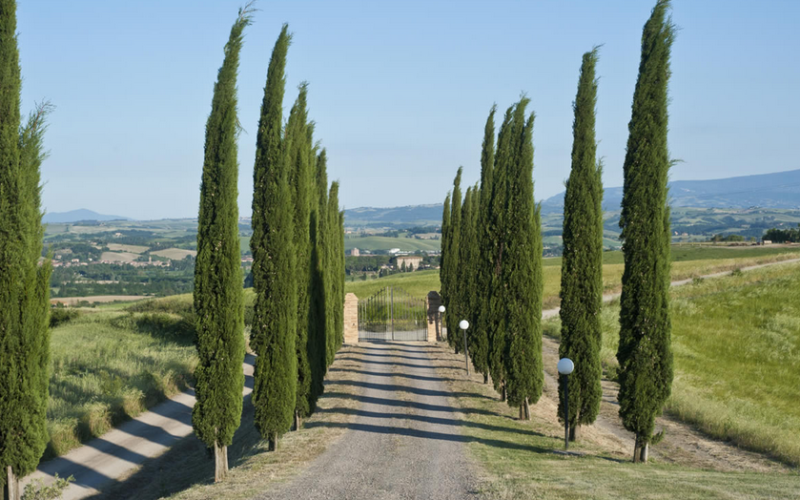 The property is at the end of an initially surfaced and then dirt road, which stretches for 1.5 km into a 100-metre cypress-lined avenue, leading directly to the villa, which overlooks a beautiful natural terrace with a breathtaking 360° view. 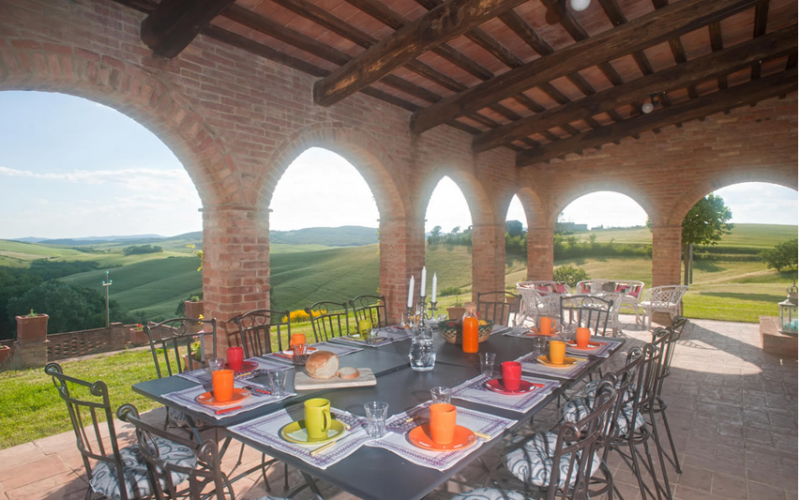 The villa has a wonderful arched porch, furnished with tables and chairs to eat “al fresco”, offering a beautiful view and a wood-fuelled oven for baking bread and pizza. There are a few steps leading from the loggia to a terrace, which is perfect for sunbathing, and a garage which houses the washing machine and relative accessories. The private swimming pool, measuring 14 x 6 metres and equipped with umbrellas and sun loungers, is located in the spacious garden. 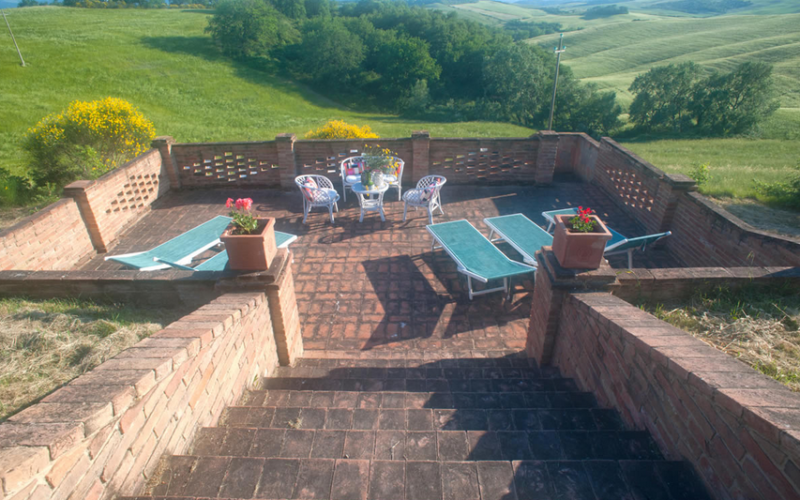 From the garden of the villa guests can enjoy a wonderful view of the hills and fields. 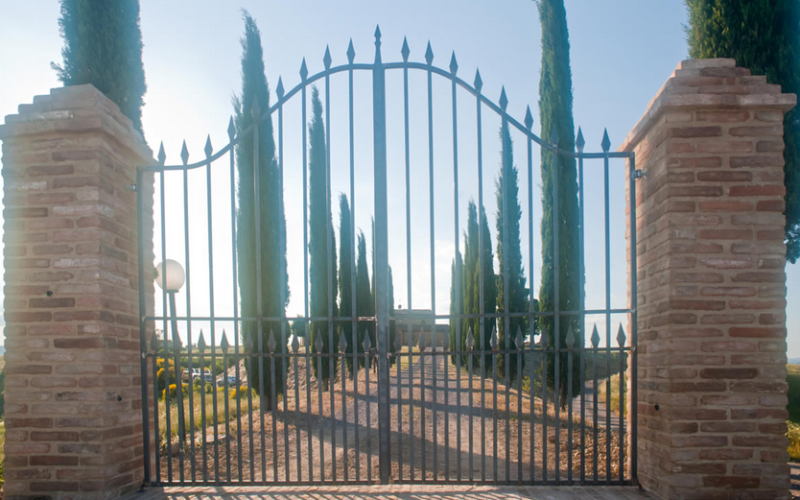 The property’s managers have regular access to the villa to allow garden and swimming pool maintenance. 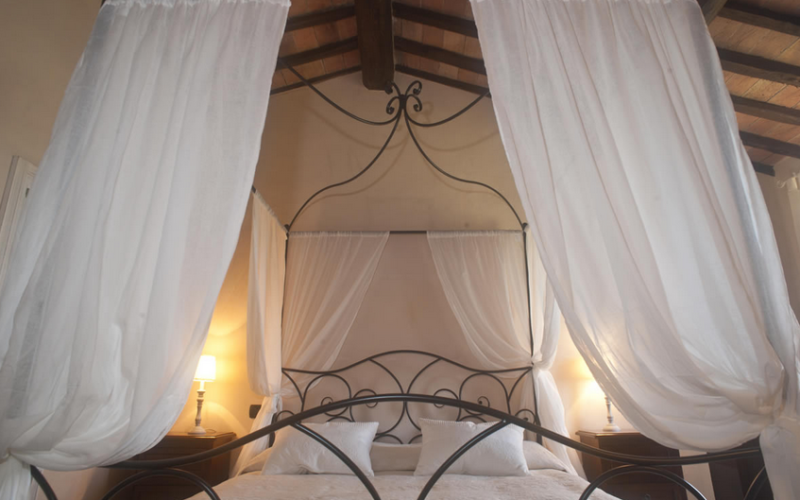 The arched porch offers access to the villa’s large kitchen, equipped with an American-style refrigerator, freezer and icemaker, electric oven, deep-fat fryer, hob with six burners, electric hot plate, grill and dishwasher. 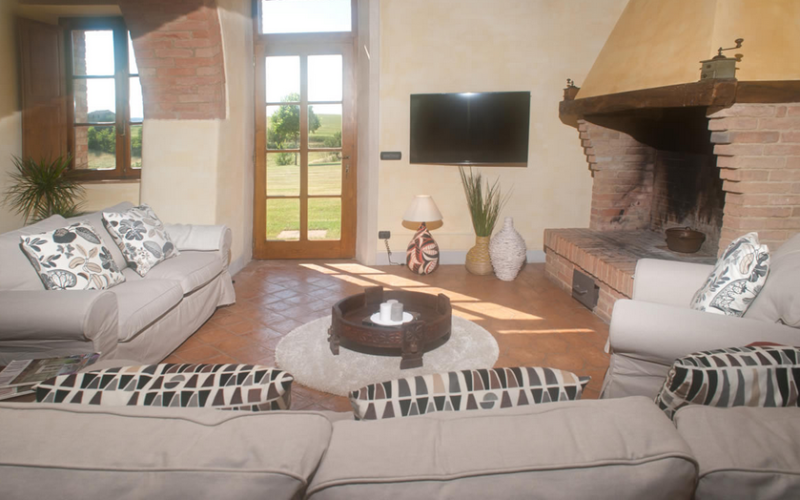 A large arch separates the kitchen from the dining/living room, which has a large table and chairs, and from the lounge with its big fireplace. On the ground floor, a door on the right leads to a service room with bunk-beds and a bathroom with shower and bidet. This room has its own entrance/exit. 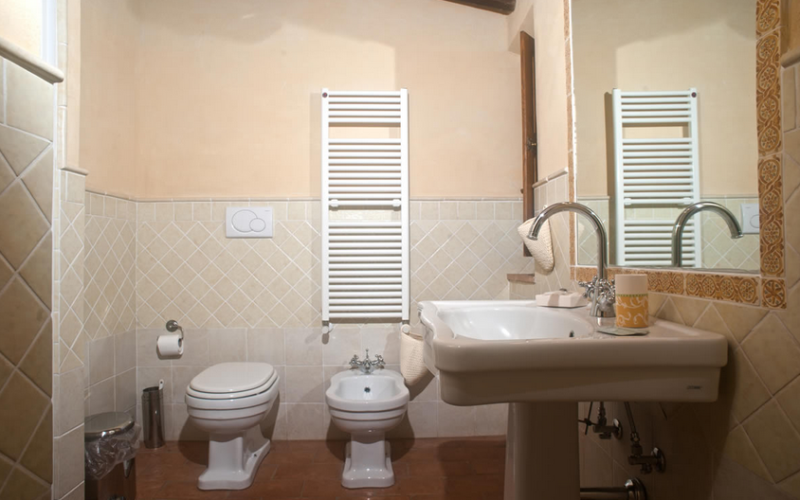 Also on the ground floor is a study furnished with a double sofa-bed and a large bathroom with bathtub and bidet. 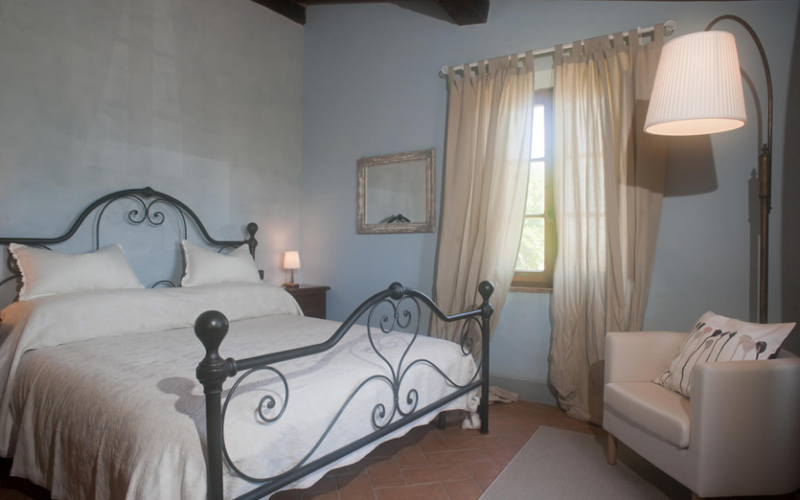 There are two other bedrooms on the right (a double and a twin which can be transformed into a double by request) each with a bathroom with shower and bidet. A large terracotta staircase leads from the living room to the 1st floor, where a corridor leads to three double rooms, each with a bathroom with a shower and bidet, one room with three single beds and a bathroom with shower and bidet, a small kitchen with a 5-burner hob, oven and small refrigerator, and a breakfast room. 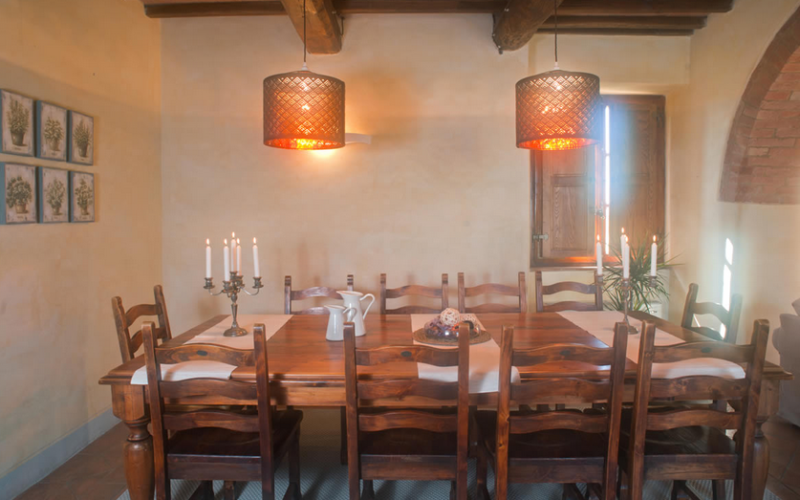 All the rooms are painted in warm colours and have handmade terracotta floors and typical Tuscan beamed ceilings. 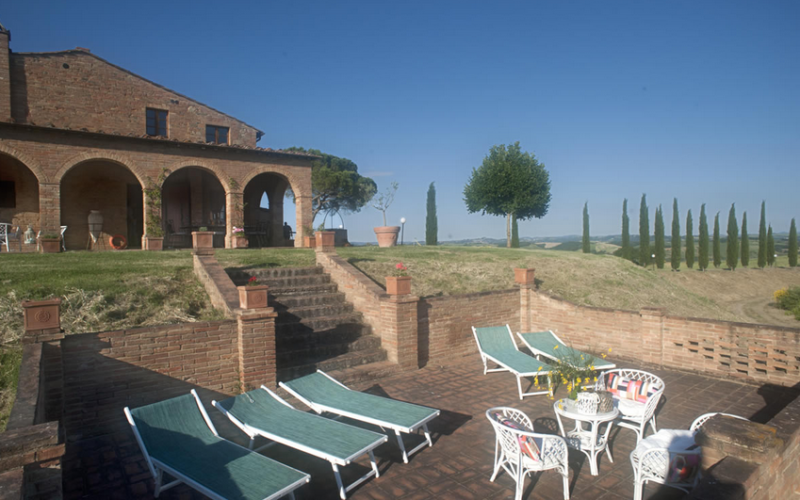 The renovation of the villa has fully respected its Tuscan origins. The furnishings are comfortable, with a perfect combination of antique and modern pieces. 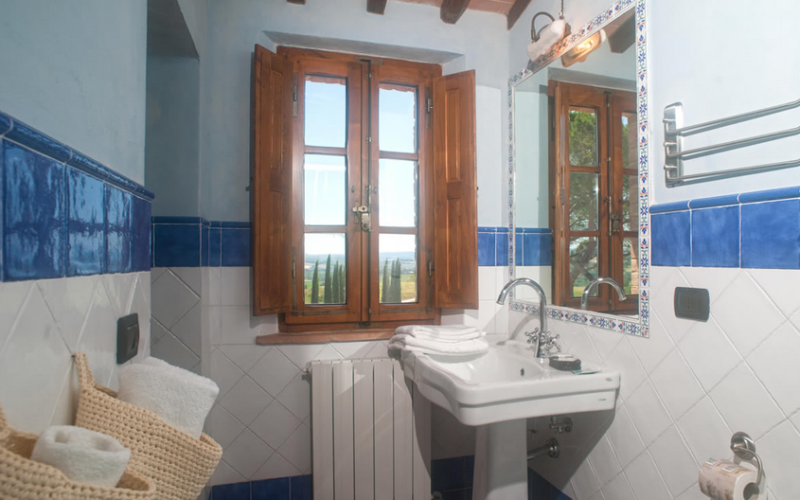 The villa is fitted with an air-conditioning system with an adjustable thermostat in every room.